The Lake Fork Valley Conservancy hosted the “Lake Fork Valley Land & Water Workshop” in Lake City on July 21 and 22, 2011 at the Mary Stigall Theater. Representatives from a range of agencies and organizations presented on various topics of local environmental concern. The two day workshop focused on the health of our local waterways, wildlife, and forest health, with an emphasis on current trends and impending changes. Closing the workshop was a presentation by Dr. T. Allan Comp of the Office of Surface Mining about incorporating both the arts and sciences in the process of abandoned mine land reclamation. Dr. Comp started the OSM/VISTA program in Appalachian Coal Country and Western Hardrock mining towns, a program that has placed Americorps VISTA volunteers in 21 locations in Colorado and New Mexico, including Lake City. The Lake Fork Valley Conservancy also recognized longtime volunteer and organization president Lyn Lampert with an Excellence and Leadership Award for a decade of unwavering commitment to the health of our watershed. 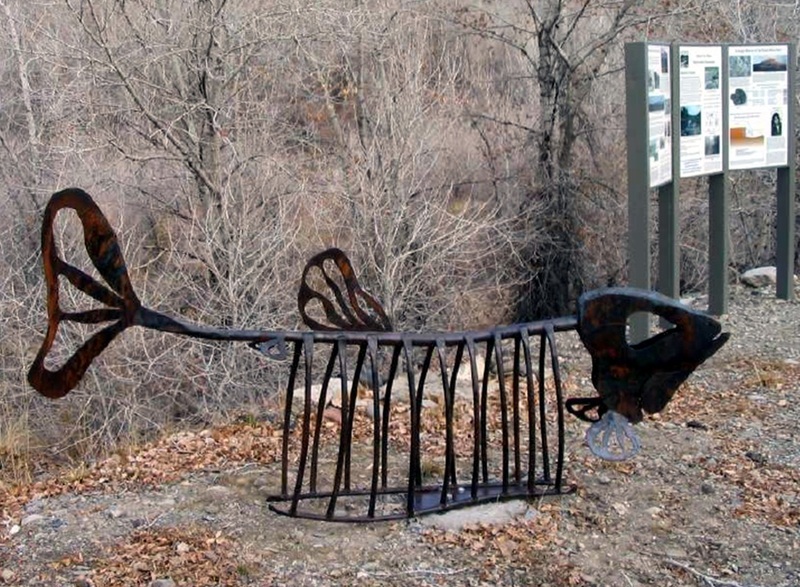 Fish bike rack at the Paonia River Park. See more in "Acid Mine Drainage & ART: Engaging the Sciences and the Arts in Community Revitalization, in presentation list on the right. Click to open and/or download. Each presentation is a PDF file. This presentation explains the idea of the watershed, and different issues associated with various habitat zones, from high alpine to sage brush. Why water sampling is important. A summary of all water data collected in the Lake Fork watershed to date, and outlined future priorities. A review of 2000-2001 tracer studies taken on Palmetto Gulch and upper Henson Creek. The importance of monitoring bug species diversity when examining river health. Anticipated species and habitat impacts from climate change in the Upper Gunnison basin. Overview of impending spruce bark beetle activity in our area. Status of the local fisheries. Aquatic Nuisance Species prevention in our area. Potential River Enhancement Project in Lake City. Incorporating both the arts and sciences in the process of abandoned mine land reclamation.